Today's Image of Mars shows a volcanic vent in Elysium Planitia, but what it also shows is two distinctly different types of lava. To the north (top) you can see a darker lava flow. 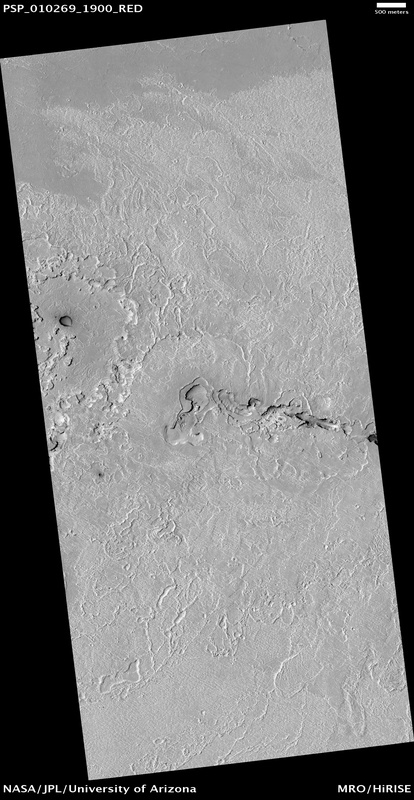 This is actually the edge of one of the youngest lava flows on Mars, which coursed through the Athabasca Valles channel system. The rest of the image is covered in lighter lava that is much older and worn than the dark lava encroaching from the north. The most prominent feature in this image is the volcanic vent in the center of the image. It was through these pits and troughs that enormous amounts of lava was once expelled. The strange depressions surrounding the vent are likely the result of erosion from lava pooling and draining back into the vent.